For a more relaxing drive. AUTOMATIC GEARBOXES USED to be reserved for luxurious large cars but nowadays you’ll find automatic gearboxes in small cars, cheaper cars too. Many people choose automatics because they ‘can’t drive stick’ or their driving license permits them to drive only automatics. Some people just like the convenience of not having to change gear and work three pedals and some like the smooth ride that many automatic gearboxes provide. Whatever your reason for wanting an automatic gearbox we’ve picked five automatic cars for a variety of budgets and in a variety of styles. Few large saloons can turn as many heads as the Audi A6 and this S Line Black Edition is even more impressive looking than the regular model. It is powered by a powerful 150hp 2.0-litre diesel engine which is paired with a smooth shifting tiptronic automatic transmission which enables spontaneous gear changes at any time. 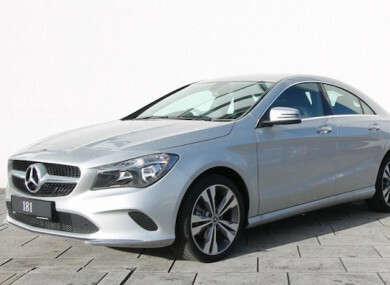 The Mercedes-Benz CLA is a handsome and slinky four-door coupe and comes in ‘Urban’ trim with plenty of bells and whistles. This particular car is the 180 d model powered by a 109hp 1.5-litre four-cylinder diesel engine and paired with a slick 7G-DCT dual clutch automatic transmission. The Renault Kadjar is a seriously stylish crossover and with this automatic transmission it is a refined and pleasant machine to drive. This model is powered by a 1.5-litre diesel that makes 100hp and is mated to a six-speed automatic gearbox. It comes in top spec ‘Signature Nav’ trim. The Dacia Duster with its Efficient Dual Clutch (EDC) automatic transmission makes for one comfortable and refined drive. The automatic gearbox shifts in a smooth manner and responds well to throttle inputs. In fact, the automatic Duster is the pick of the range, for me. The Ford Fiesta is a perennial favourite with Irish buyers and for good reasons too; it is cheap to run and great to drive. Its cabin is compact but there is a good use of space and a decent size boot too. This Titanium specced model is powered by the peppy 100hp 1.0-litre EcoBoost Stop/Start petrol engine and mated to a six-speed automatic gearbox. Email “5 cars with automatic transmissions for a range of budgets”. Feedback on “5 cars with automatic transmissions for a range of budgets”.